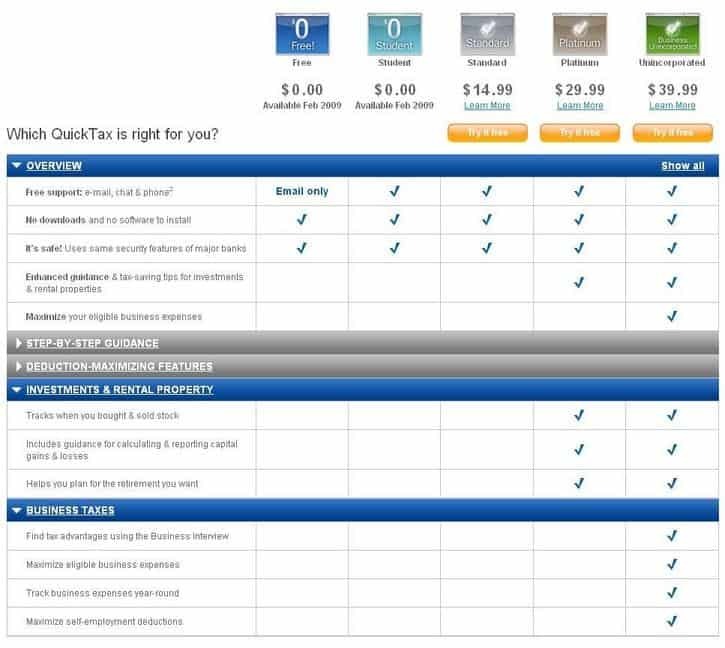 QuickTax Online Review and Giveaway! In the past when my taxes were a little less complicated, online tax filing was my favorite method to get things done as it was quick and cheaper than getting an accountant. The two online programs that I used most often was ufile and QuickTax. Both programs are fairly comprehensive with the biggest difference being that QuickTax offers phone support (long distance charges apply) for their paid products. They both offer free NETFILE if your income is less than $20k along with free use of their program before submission/NETFILE. Basically, you can use the QuickTax online software to fill out all of your tax information and check out your tax return amount before paying anything to QuickTax. You’ll have to pay to file however. The ideal solution for Canadians with more complex tax needs, including guidance for investments & rental income. What’s neat about these online tax filing programs is that you can try them for free and only pay if you file. If you haven’t tried these tax programs before, you can give QuickTax a spin here. As tax season is already in full rush, QuickTax sent me an email promoting their products. As I enjoy giving away products here on MDJ, I asked if they would be willing to giveaway a few copies to my readers. I didn’t have any expectations, but they came back with a very generous offer. We are giving away 3 QuickTax Online Submissions! Not only are we offering 3 submissions, the winners will have the choice between standard, platinum or business unincorporated! Great huh? Answer this question in the comments: How do you file your taxes every year? Online? With an accountant? Paper? All entries will be put into an electronic hat and 3 winners will be randomly chosen. This offer is for QuickTax Canada only. Contest will end Friday 5pm EST Feb 20, 2009 and the winner announced shortly afterward! I always file online with Ufile, but I’ll give QuickTax a go. Always file online. Thanks for the opportunity! You can increase and decrease figures and use it exactly like you said….a little game. Granted you can’t file with it, but for those that use an accountant, like myself, it’s great to see where your final numbers will be at the end of the year. For those of you with PC Financial, they offer a discount too – $11.99 I believe. It’s linked off the online banking portion of the website. I love Quicktax Online. Been using it for 3-4 years. I love that when I sign up again, it pre-populates all my old info, and even carries over any unclaimed deductions! I always file my taxes on paper, but with my taxes being a little more complicated (rental income this year), I was thinking of going to an accountant or trying some software. I’ve always filed with an accountant and plan to do so this year as well especially since I have some capital gains and capital loss. However I’m also planning on running my numbers myself to see how much mine differ from my accountant. If there isn’t that much of a difference then I’ll try filing my own taxes next year. You can also get the 20% off deal from td canada trust. I am “taxation challenged,” and trying to file my own taxes brings about a frustration unlike anything I have ever experienced. I finally made peace with paying an accountant a few hundred dollars to file for me. As much as that hurts, I know this is one expense that is truly worth it for me, since doing my own taxes causes more stress and anxiety than I am willing to undergo. Don’t tell my accountant, but I would gladly pay him five times as much to avoid that agony. I have a real issue with the complexity of filing annual taxation – the system is so complicated it has effectively taken the ability to file one’s own taxes out of the hands of ordinary Canadians. We are one of the most taxed countries in the world to begin with, and yet if we want to ensure that we are filing our taxes correctly each year, we are basically forced to pay even more money for an accountant, tax software, H&R Block or similar institution, etc. I have found that my accountant is able to identify many credits and write-offs that I otherwise wouldn’t be aware of, which ultimately gives me a larger return. So if I have to file my taxes, I’m quite happy paying for this service – it seems the lesser of all evils. Perhaps one day I’ll be brave enough to file my own taxes. Until then, I’ll pay for the stress avoidance. MDJ, I’m a long time, daily reader (and first time poster). Keep up the great work. Years ago, I completed my returns on paper. Over the last 7+ years, I’ve used QuickTax. Intuit has done a nice job with their software, making it easy to use and allowing anyone with some moderate tax knowledge, to process their return. I also like the fact that your refund, via an online tax filing, is turned-around by CRA in about 10 working days. It’s always nice to get a cheque in the mail! FT – thanks for the great site. I read and contribute often and I enjoy blogging with other investors; growing a great body of investment knowledge. I used to use Quicktax all throughout College when my income was low and when I didn’t have any investments. I file my taxes online with filing software like Quicktax! I started using online filing using softwares like Quicktax years ago. I got hooked on the ease of use. I don’t see myself going back to paper filing again. Thanks for the great site. I discovered it by chance and it became part of my regular read. Great job. I always file online and use quick tax. Thanks for the great offer! I netfile my tax return using Quicktax each year. Is 1 free submission good for a joint return? I always use QuickTax and file online. They make an excellent product. I usually went with Cute Tax Online, at http://www.cutetax.ca but then last year I switched over to Studio Tax, http://www.studiotax.com , because it was free and does the job just as well as any of the others. I file mine online, usually through H&R Block’s website. Geek that I am, I’m excited to do my taxes this year because I made a lot of RRSP contributions last year, & I also changed jobs, which means a big fat refund for me! Of course half of it is going to debt repayment, and the rest to my savings account. We use H&R block most times. Include me in the H&R block status. After playing around with the aforementioned website, now I know why. I filled in my information and it said I had a balance owing of $7k+ Yikes, that can’t be right. Personally, I’ve used quicktax a few times. When I was a student, my parents just had their accountant do my taxes as well. I was a volunteer tax-preparer for one year as well. Basically filling out tax returns on paper for lower-income seniors. Quite simple since most of them only had CPP/OAS as income and no investments. I have always used Quicktax (except one-time when used Accountant due to complex tax return). Would like the opportunity to use QT again. I used quicktax in the past, but last year switched to studiotax. I always file online. On a side note, I *do* think that everybody should prepare their taxes by hand at least once in their lives – while it can be frustrating, it definitely gives you a better understanding of how it all works. I used Quicktaxweb for several years & will keep on use it. Thank you. Is MDJ getting a free copy for promoting quicktax? I am with you. Studiotax is great and easy to use. Plus it is free (although you do have the option of making a donation) for everyone regardless of income. I currently use an accountant, but I’m sure I could save my self some dough if I were to do it myself. I’m in for the contest. I’ve used Quicktax Online once before and will likely use it again this year. I file online but have never used QuickTax. I normally file with ufile. I always check with pen and paper, and have been using the free http://www.studiotax.com/ . Always happy to try another! I file by paper for myself and my elderly parents. There’s a small accounting firm by my house that will handle my return and netfile it for me for $25.00. I leave all the hassle to them! I always file online with NETFILE using Ufile. Usually have accountant do it. QuickTax and Netfile, but I have yet to use QuickTax online version. Was using genutax software (www.genutax.ca) – pay once, use forever – but switched to mac last year, so looking for new options. Currently use an accountant; thanks for the opprutunity! Use Ufile but I buy the disc b/c u can then use it for more than one person (ie. my wife an I). So the cost is then $19.99 split between two of us. If you use it on-line it’s 14.99 per person. This was the case last year — haven’t checked this year. I also usually file online using either Ufile or Quicktax. Mainly paper unless have questions I can’t answer then run to accountant. Paper but willing to make the change. I file with an accountant, but would be willing to give QuickTax a try. I have rental property and used to do a lot of contract work, so it made sense to me to have an accountant do my taxes. My income situation is a little simpler these days (no contract work, but still have rental income). For those of you using an accountant, what does your accounant charge to prepare a personal tax return? I file online with QuickTax Web. I file online, usually using uflle, but I’ll try QuickTax… especially if it is free! I do my taxes as well as my fiance’s with Ufile, because i have used ufile since university days it has all my historic data like tax credits and things like that which makes it easier for me do it always online. so far things have been fairly simple. I always netfile with Quicktax. One thing to note is that you don’t need the platinum for rental income or investments. I think it’s just more user friendly. Moved back to Canada in 2007, so filed my 2007 taxes in March 2008 using reams and reams of paper. (Nothing like a dual tax year, even if the overlap was only one month!). And will be filing online this year – probably using StudioTax (recommended by a friend)… but would happily try QuickTax if it were free! My life is getting more complicated, so I get my accountant to do my returns each year. I used to use QuickTax, and wouldn’t mind trying it again to see if it can handle rental expenses well enough. I usually have an accountant do it, but may try online this year. I’ve always done my taxes by hand and on paper. Maybe I’m living in the stoneage, but it works for me! Good old paper, always. Maybe its time to get with the times. A timely offer, as I have just been considering using this QuickTax online tax-filing methodology for the very first time. We have been using an accountant for the past ten years or so, when my wife had her own business, but with this being wound down, life (and hopefully tax filing) has become less complicated. I, too, share the frustration of one of your other commentators about the complexity of the tax system. I am well-educated and am familiar with much of the jargon, but I still find it a real challenge. What, then, does the average person do? I netfile with quicktax for my entire family and friends. The last few yearsI have filed online using CUTETAX (yes, it sounds ridiculous) always found it easy to use, and they are certified by the CRA for NETFILE. Free to file if under $25K, and if I remember correctly, it was $9.99 to file my husbands (much larger) return. Netfile with Quicktax for the last 5+ years. I’ve used QuickTax online for a few years. No complaints. But, this year I’ll be using StudioTax, since it’s free. I’ve already tested my 2008 return in both StudioTax and QuickTax online. No suprise, got exaclty the same numbers. P.S. If I win, please donate my winnings to some other reader who may use the Quicktax offer. I file online, its the quickest and easiest method of all. I always file online, but have used different programs. Last year I used Ufile, but for several years before that it was QuickTax – I’d be happy to go back, especially if it’s free! I’ve been filing online for years, and using ufile.com. I’m considering a switch to quick tax this year, so this would come in really handy! I did my taxes on paper and filed with Telefile for years. Last year I filed with H&R Block because I moved north and I thought there would be something complicated about incorporating northern tax benefits. Nothing could be further from the truth. I’m giving QuickTax a shot this year. I prepare my own return using Ufile and I netfile. Thanks! I prepare my taxes myself by paper. How do you file your taxes every year? My wife files them, do them up on software – but submit them by paper. No Pro accountant, but we get tips from my sister in-law. I file online with Quicktax. I have done mine on-line for the past few years. Tell me..is it the Quebec version included with the Canada version?? No joke. I have to submit to the Quebec gov’t as well due to their weird system. I use an accountant. I would like to get more involved though, since I’ve only ever used an accountant. This year I think I’ll do my taxes on my own but still have the accountant do it and compare the difference. I always do our taxes online. I have used Quicktax for the last number of years and it does a good job. I typically purchase Ufile, and netfile my returns. I’ve always used an Accountant – but after reading this post and the reader comments, I’ll try one of the online software solutions this year! Thanks! I am a self-employed realtor. I file my taxes through my accountant for the last 5 years. Prior to that I used Quick Tax. I file the taxes myself on paper. I feel that I can do them much better than with an accountant because I finally understand what I am doing. When I had an accountant, he never explained anything, just gathered the papers I had for him. I did not even knew that I could deduce medical expenses from my income tax, it was that pathetic. I always file online… I usually try out a few programs and see which one gives the best result.. I think I used CuteTax last year. I file with an accountant but want to try this year with a program. I used an accountant for a few years, but used QuickTax last year. Our tax returns were reasonable simple and it was not difficult to complete the returns online. I will likely be doing the same this year. I use QuickTax. Quite happy with it, except it caused me a lot of grief when reporting partnership income (from my InterPipeline holdings.) Great in every other respect. Our investment taxes are fairly complicated and I have a sole-propriotership, so I have my accountant do our taxes. However, I have just asked him (accountant) which tax programs I can play with to determine how much/little I’ll pay in tax if I just earn my current investment income and not my business income – sort of a pre-retirement exercise. A free copy would be most appreciated. Online – ever since netfile came out. Thanks, I file online and have used QuickTax for the last 3 years. I used to use Quicktax but then switched to Ufile and I file online. Telefile … Fill out the paper forms (as our taxes are fairly straightforward) … but submit over the telephone. Fairly quick, and the same refund turnaround time as netfile … and best of all, free! For preparation, I’ve used QuickTaxWeb for the last number of years. Considering the offline QuickTax this year though. Either way, I’ll continue to NetFile, as that’s by far the most convenient thing the CRA has ever conceived. In the past I have used an accountant but will be filing online this year and am planning on using Quicktax. Thanks for the opportunity to possibly win a free copy. I’ve filed using Ufile for the past 2 years. Previously, I gave it to my parent’s accountant. I’ve used mytaxexpress in the past, which sounds similar to QuickTax, but last year, due to investments I used an accountant for the first time. Last year I did online using ufile and I also learned that CRA accepts electronic copies of all the documents so now I scan all the receipts and throw away the paper pages which tend to get lost. I have used QuickTax for the past 5 years and will continue to do so. I file my taxes online with Studiotax. It’s free and just as easy to use as Quicktax. Last year I actually did them on paper. My parents suggested that I do it just once on paper and I had a very simple return anyway. In previous years I’d used QuickTax or UFile. Online using ufile.ca for 4 years. I’ve always used paper and then TeleFile. Absolutely no cost! But my situation is getting a little more complicated now and I’d love to try QuickTax. Thanks for the great info and articles on your site! I have been using Ufile for the last few years. I’ve always used quicken quicktax, but plan on checking out U-File this year too. I’ve used Quicktax and UFile- both are pretty similar. I always use some sort of PC-based software to file my taxes, but this year, I’d be willing to try out the online version. I file online with QuickTax. Now that we’ve switched to a Mac a new version would be great! I file online with QuickTax software. I am ready to try an online version. I filed online every year for the past 5 years. Prefer quicktax for the interface, but ufile for the cost. I file online!!!! But I use another free tax preparation software: StudioTax. I usually buy QuickTax or use some of my parents’ extra QuickTax licences. I file online with eFile, but have never used “QuickTax Online”. This year I am considering StudioTax. Next year I will have rental income and expenses to deal with, so my needs may change. I file every year with my mother-in-law, who is a CGA. I know she files the return online. Old school – by paper. Doesn’t mean I would give up the chance to win a free copy of QuickTax. I’m afraid that I haven’t filed for several years — but am working on it and will be getting them all in on paper soon. Then I want to move to online and never get myself in this mess again!!!! I always file online, using MyTaxExpress for the last three years. I only started filing online two years ago, but I’d never voluntarily file a paper return again. I file online with Quicktax. Very convenient. This is my first time filing, and i’ll be doing it online! Thanks! I file online using QuickTax. For the past couple of years, I’ve filed online using QuickTax. I’ve been filing my taxes with QuickTax for the last several years – they got me hooked when I was a student and could do it for free. I’m a Quicktax fan myself (been using it for 3 or 4 years now) and I don’t have my copy yet. So put me in to win a copy. I file online using Ufile. I am probably going to try Studio Tax this year. Unless I win. I file my taxes myself using UFile and submit over netfile. I file online, so put my ballot in for sure. Online. It is so convenient and I love that last year’s info is carried over. I file our returns using QuickTax online. It’s fast and easy and gives good feedback on your potential refund as you enter your information. I file online using QuickTax software for the past five years. Used an accountant last week because of my wife’s business but it was expen$ive so this year I am doing my own with software. Used quick tax before and haven’t paper filed for years. How do you file your taxes every year? Online – Quick tax for last 3 years. I have NetFiled using Quick tax standard for the last 6 years. I’ve been completing my returns using various software programs for 5 years now. Last year I used studiotax. I’d say it was not as user friendly and doesn’t have all of the bells and whistles, but it worked and the price was right. I have used QuickTax (local version) for at least 5 years now, although I needed an accountant last year due to some extra complications. I do not mind processing the data data myself, and have found QuickTax to be a useful to in doing so. In fact, I often use it to try different scenarios (e.g. donations allocations between my spouse and I, RRSP calculator for last-minute contributions, etc). The “side bar” that shows a summary of all the numbers for both returns is a great feature. I have used Ufile for the past few years, but would like to give QuickTax a try. Both through an accountant and then online by myself! Just like to double check his work ;-) Good for you to ask for a giveaway, never ask, never get. I file my taxes online every year. I use Quicktax every year to file my taxes online. I file with QuickTax every year. I have been using quik tax for years. I started using the online edition as soon as it was released. I have also been using netfile since I was first eligible. It’s quick and easy. I do see my refund faster too. For those who may not know, epost users are offered a 20% discount for quicktax online. Details available at epost.ca. This year would be my 4th year using quicktax..pretty simple to use! I’ve been using QuickTax online for years now, though last year I found some special cases which I needed the software and not the online version – it allows you to view and manually update forms in some places that the online version does not provide access. I’m a loyal QuickTax filer…easy lay-off, lots of quality explanations, a great tool…have been using it for 7 or 8 years now! Last year I filed with an accountant, before that online and the year before that on paper. I always file online with Quick Tax. Its very fast, easy and efficient. I have been filing online with Quick Tax for about 4 years now and I love it… it’s so easy to use! I’ve been using QuickTax online for a couple of years, and find it to be a great tool. Never had any issues. I have used QuickTax online for the last 4 years for both myself and my wife. 2 years ago we started using the Small Business edition (or whatever they call it now). It could be slightly better in terms of navigation, but it does the job. I’ve done it every year online through Netfile (except the first year I was in Canada, someone else did it for me with the paper version). It’s free, written by a nice Canadian guy. Works great, and it’s given me a much more thorough understanding of what’s going on. I always used to take advantage of my uncle (who is a CA), but given my straightforward situation it’s become a bit overkill to use him. We’ve used QuickTax the last few years. I’ve used H&R Block Online for the past few years which I think is associated with QuickTax. I moved to Canada in April last year, so this will be my first time to file my taxes in Canada. I’ve never had to do it before; in the two countries I lived in previously, the company I worked for filed our taxes for us and it wasn’t this complicated. I plan on filing taxes online and hoping software like QuickTax will make it less painful. Our family always uses QuickTax. It’s super user friendly and fast.